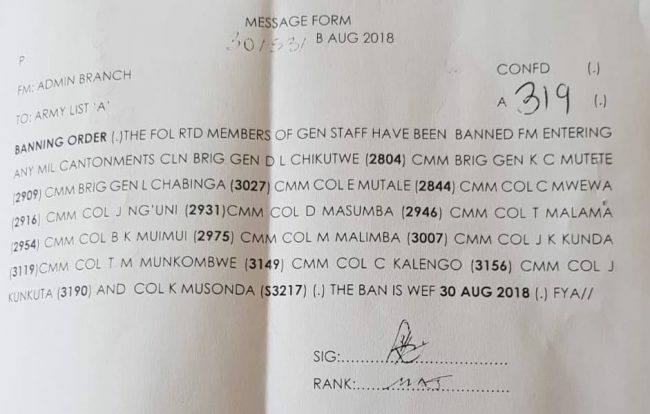 Army commander General Paul Mihova has banned the immediate past Army Chief of Admin General Mutete and 14 other members of the general staff from entering the barracks after accusing them of being a bad example to the serving soldiers following their continued demanding for their allowances owed to them by the military. General Mutete is mong the general members of staff who were correctly retired and some on contract that were demanding for their gratuity for those who were on contract and Last Pay Certificate for those who were correctly retired. The Army Commander directed the officers in Charge of all barracks not permit the enlisted members of generals from entering their barracks. The rejected Generals members of staff are also not allowed to get any where close to military bars or Canteen to enjoy meals and beers. The Army Commander has also accused the general members of staff of conniving with some serving soldiers to mount pressure on government through him for several allowances, including unpaid leave days. Some of these general members of staff were retired in national interest and other had their contracts terminated after the Army Commander accused them of being closer to the opposition United Party for National Development (UPND). The Army has also failed to pay serving and retired soldiers leave grants and this development has caused general out cry among soldier. Besides these funds, the soldiers in some barrack are complaining the soldiers are not getting hardship, meal, housing allowances. The Army Commander has also caused the soldiers to have a monthly deduction from their pay slip to go towards a mess bill for the meal they take daily. Army Commanders was supposed to send back the withheld allowances back to the treasury. Instead, the money is being shared between the Army Commander his Chief of Finance Col. Dan Tembo, Kaiser Zulu who is a brother in law to Col. Dan Tembo who is a Chief of Finance. 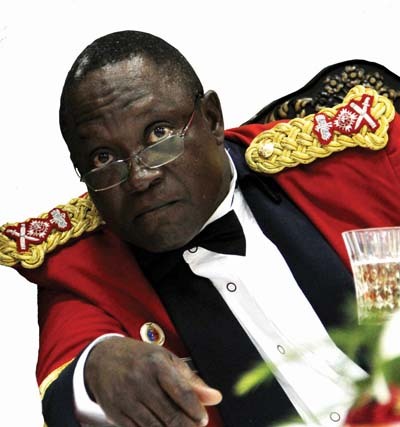 The curtail created by the Army Commander to not only to steal money meant for the soldiers but also to cause terror in the barracks is made up of Kaiser Zulu, Dan Tembo, and the son of General Mihova, Kayombo a civilian, including Col. Evans Simukoko director of military intelligence. The news about barring the general members from entering the barracks and enjoying free services they are entitled to them has unsettled other soldiers both serving and retired and described the development as unfair. The soldiers have warned the Army Commander and his minions of serious consequences because some aggrieved senior army officers have great influence among the soldiers saying the consequence is likely to be felt among the curtail members because of their careless decision and corruption which these senior Army officials are harboring. The aggrieved solders expect to see the president taking a serious action against the Army Commander soon before he causes a serious mess which will be embarrass the country. Meanwhile Kayombo who is the son of the army commander has been given a contract to supply sports kits as part of the Uniform to the Army and is running an enterprise named day light shopping enterprise located in the Arakan and other barrack. The soldiers have watched the illegalities being perpetuated by the Army Commander and his minions for long and warn that they will not allow this to continue any further without the perpetrators meeting stiff resistance..